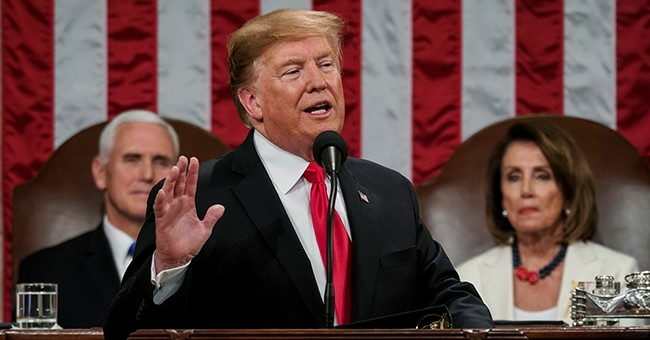 Speaking from the White House before a meeting with his Cabinet Tuesday afternoon, President Trump slammed the latest deal submitted by Congress on border security. The complete details of the legislation haven't been publicly revealed, but does include just $1.3 billion for 55 new miles of fencing and decreases the number of illegal aliens Border Patrol and ICE are allowed to detain. "Am I happy at first glance? I just got to see it. The answer is no. I'm not. I'm not happy. But am I happy with where we're going? I'm thrilled because we're supplementing things and moving things around and we're doing things that are fantastic, taking from far less important areas and the bottom line is we're building a lot of wall," Trump said. "Right now we're building a lot of wall. You think it's easy? We're building it in the face of tremendous obstruction and tremendous opposition from a small group of people." A national emergency declaration is still on the table as an option. If a deal isn't reached by Friday, the government will partially shutdown. "It's always nice to negotiate a little bit right? But I would hope that there wouldn't be a shutdown. I'm extremely unhappy with what the Democrats have given us. It's sad. They're doing the country no favors. They're hurting our country very badly. But we certainly don't want to see a shutdown," Trump continued. "The bottom line is on the wall, we're building a wall and we're using other methods other than this and in addition to this, we have a lot of things going." "I don't think you're going to see a shutdown. I wouldn't want to see a shutdown. If you did have it, it's the Democrats fault. And I accepted the first one and I'm proud of what we've accomplished because people learned during that shutdown all about the problems coming in from the southern border. I accept it. I've always accepted it. But this one, I would never accept it if it happens, but I don't think it's going to happen. But this would be totally on the Democrats," he added. Yesterday Senate Majority Leader Mitch McConnell slammed Democrats’ new demands on fewer detentions as a stunt and poison pill. “Here’s what happened: House Democrats decided to add a poison-pill demand into the conversations at the 11th hour. It’s a new demand. And it is extreme: A hard, statutory cap on the number of illegal immigrants who could be detained by the federal government. This would result in the release of thousands of criminal aliens and our inability to detain thousands more criminal aliens whom our federal and state law enforcement authorities will apprehend. This is a poison pill that no administration would -- or should -- ever accept. Think about the absurdity of this," McConnell said on the Senate floor Monday. This story has been updated with additional quotes.